This project explores the creative processes of the American-born artist, James McNeill Whistler (1834-1903), as an etcher and printer. 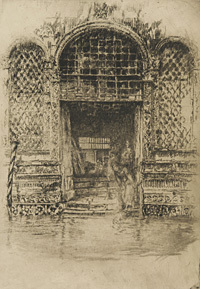 A major figure in 19th century printmaking, Whistler created over 490 etchings. The evolution of each etching from the copper plate through different states to the final print is described and fully illustrated. The catalogue includes many previously unknown etchings, plus fresh information on titles, dates, subjects and sitters, technique, and the 19th century art market. The project is based on collaboration between three major institutions: the University of Glasgow (recipients of Whistler's estate), the Art Institute of Chicago and the Freer Gallery of Art, Washington, DC. It includes prints in public and important private collections. A preview of this catalogue raisonné was launched in 2011: the full catalogue raisonné is now (October 2012) online. It is totally free and available exclusively online. It will not be published in book form, so we will be able to update the catalogue with new data and images. Input from viewers is welcomed: we hope you will enjoy the website.